It's quite interesting to have a project being exhibited in different places whilst at the same time continuing to work on parts of it. Work from 'In This Place' could probably be considered quite finished in some ways but in my own life it continues, new work produced. How to wrap up a project that doesn't quite feel like it should wrap up? This is no ordinary project for me, this is personal and because of that it has a life of its own. I work on it every few months, off and on, when it feels right, when it is possible. There are relationships within this work, I am an auntie and great-auntie, we are connected. I am the insider. I am the outsider. I usually let work sit there before I do anything with it. It sits on my computer screen and I look at it, or perhaps it looks at me. I do small workprints from the local photo shop and stick them on my wall. I live with them, am surrounded by them. Perhaps immersed. 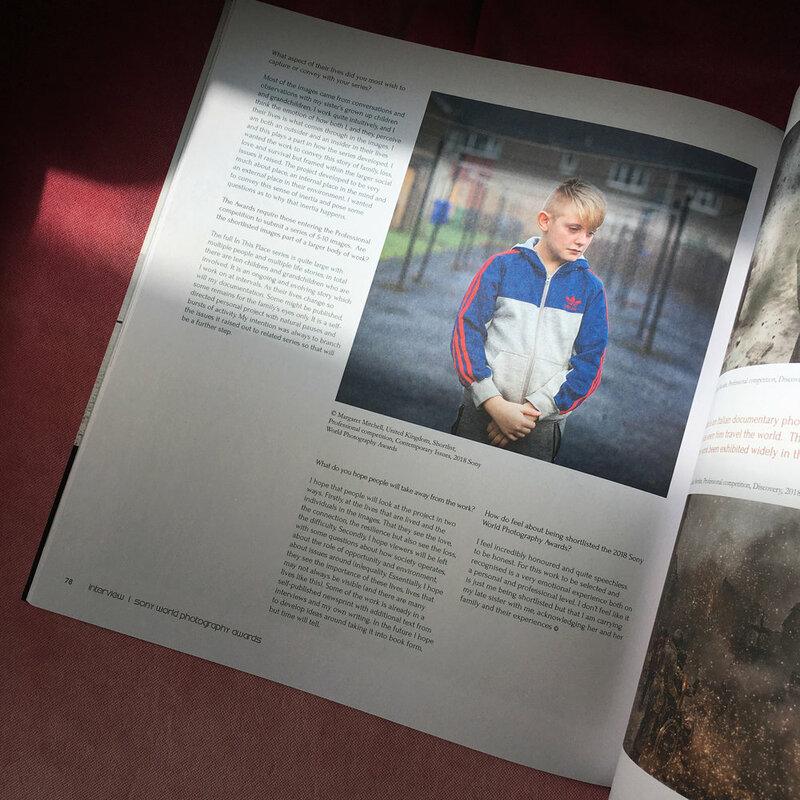 I wrote a piece for the National Galleries of Scotland recently on my experience and thoughts on photographing my own family members. The blog talks about the two series Family and In This Place of which six photographs can be seen at the current exhibition When We Were Young at the Scottish National Portrait Gallery. It was interesting to reflect on this work and discuss photography, representation and the responsibility we have to others when photographing them. I am delighted that six of my photos have been acquired by the National Galleries of Scotland for their collection - two images from 'Family' (1994) and four from 'In This Place' (2016/7). It is a really nice selection from the projects which tells a story across three generations from my family. Weaving its way from my late sister Andrea, through her youngest daughter Chick and onto Chick’s daughter Leah. Below you can see the selection from the projects made by Anne Lyden, International Photography Curator at the National Galleries of Scotland. Displayed first is Andrea holding a photograph of her children (including Chick) in front of her face back in 1994. An additional photo of the three children, slightly younger, can be seen on the wall behind her. Chick is then shown in the kitchen as a child in 1994 and then nowadays, as an adult, at the back of her flats. The next image shows Chick with her arms around her own daughter Leah. Finally the environment of Leah is pictured: firstly as a portrait of Leah out the back of the flats were she lives and then inside the flat, a photo of her pink room with the broken window. The boarded-up part of the window decorated with felt pen by Leah - to make it more beautiful, to make it fit in with her room, including the words “Leah ♡ Dadd”. These six images succinctly convey a strand from my family’s story - a story that raises questions on choices in life and the influence of opportunity and environment on that choice. The photos are included in the current show at the Scottish National Portrait Gallery ‘When We Were Young: Photographs of Childhood from the National Galleries of Scotland’ which is on until 13 May 2018. I am really excited that In This Place will be opening at the Lillie Art Gallery on Friday 7th October as part of a Street Level Photoworks off-site exhibition. It will include new work taken at the beginning of the summer this year including the image below. Thanks to St Andrews Photography Festival who are showing some of my work throughout the month of September 2017. I popped up for the launch and had great chat with passing people as I was taking some pics of the work. There are 12 images from 'In This Place' on show along The Scores which overlooks the East Sands in the town. The full program can be seen on the festival's website. It's Nice That got in touch recently for an interview about In This Place and Family projects. Thanks to Rebecca Fulleylove who wrote a really nice piece on the work. Amongst other things I was asked about the challenges in doing the work as well as recounting what it was like to photograph my family back in 1994. For me this type of work - as most photography - carries a large amount of responsibility with it, in both representing correctly and involving throughout the people that are photographed. That is a separate post in itself and one I'll get round to writing as it is massively important to the way I work. I was super excited to be asked for an interview with FotoRoom recently. It was especially interesting to be asked about how the two projects Family and In This Place relate and give some background to them both. Interesting questions from FotoRoom that made me reflect on the projects together. One of my portraits from In This Place has been shortlisted as a finalist for the Kuala Lumpur International Photoawards. The portrait is of Steven that I took in January 2017. I am really excited to be a finalist for this award whose theme this year is "Defining Family'. Winners will be announced in mid July and the exhibition is on in September. I'll post more details later. I also want to write about why having this particular photo shortlisted means a lot to me. That's for my next post! It was a lovely surprise to wake up, drink some coffee and find out I was photographer of the day over at the Photographic Museum of Humanity - PHMuseum. You can see my profile on their website and please take some time to explore all the great stories they feature. Thank you to Photomonitor the review of In This Place as part of the group show 'Ambit: Photographies from Scotland' at Street Level Photoworks. I am delighted to have been chosen by Firecracker to be April's featured photographer. Founded by Fiona Rogers, Firecracker is a fantastic platform supporting women photographers in their practice. I am both honoured and delighted to have work featured from both Family and In this Place. Work from In This Place will be in the show Ambit: Photographies from Scotland from the 22nd April 2017 - 18th June 2017 at Street Level Photoworks in Glasgow. Ambit is a new partnership between Street Level Photoworks and Stills, Scotland’s public venues dedicated to photography. The exhibition will be presented across both venues as a joint venture embracing some of the current tendencies and innovative talent from the art photography sector in Scotland. Margaret Mitchell's In This Place looks at family and home, connections and place and touches on issues of social and personal inertia. Behind a personal familial connection sits a larger narrative of social mobility, environment and choice. Do we have choices in life or are some predetermined to an extent and made for us? Fundamentally, this is a story of people’s lives: what they do and what they want. Where the ‘place’ is both mental and physical: where we put ourselves and where we are put, sometimes by others and sometimes by circumstance. What puts us there, what keeps us there, and do we want to be there? Stephen McLaren interviewed me for the Document Scotland blog recently, talking about my current work In This Place and the project Family that preceded it by over 20 years. You can check it out over on their website.